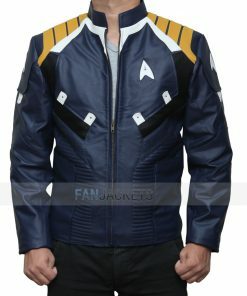 Captain Kirk Star Trek Beyond Jacket. ONLY 15 LEFT IN STOCK. PU leather makes this jacket inexpensive. It may not be real leather but lasts up to good 3-5 years. Erect collar with branded zip closure to elevate the jacket’s style. Got this jacket a few days back and I must say it’s a damn good jacket. First of all, it’s not heavy at all and fits well on my body. Zipper works well. And above all, I got so many compliments from my friends. This jacket is truly exceptional. I was really confused at first because my shipment went late. I called the customer support, and they told me there must be some problem, and after waiting what I received was worth the wait. The texture of this jacket was really smooth, and the design is just perfect along with the colors. It’s just like having the real one. I am truly happy. Love it! Just got this jacket after the release of the movie and found it good except for some problems with the customer support. I made contact with the customer support guy regarding the inquiry for shipping of the jacket, but he was very lazy to respond to my queries. He made contact after two days, and I found out that the shipping will be a bit late due to some technical problems. The overall jacket is good and can be used for casual wear. This apparel is excellent. 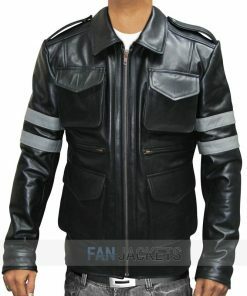 I am a Star Trek fan, so I ordered this jacket a few days back. It is so soft and lightweight. Did not feel heavy on shoulders. Plus, it’s breathable. The design is screen accurate and fits perfectly on me. My husband is a fan of Star Trek and has watched every single movie released, so I bought this jacket for his birthday as a surprise. He was so happy to see the jacket as he was looking for this piece for such a long time. Thank you fanjackets. Feels great because of its light weight and soft material. The design is perfect and looks cool. The star trek jacket I got had a little problem with the shoulders. The stitching was not neat, and it was a bit aligned out at the shoulders. I had to send the jacket back, and they sent me a replacement, which was fine. Deducted one star for the faulty jacket not for this one. It’s a great jacket, but one of the front pockets was damaged, and I was not able to put anything in it. Contacted the customer support and they were very cooperative. Finally, they sent me another one with the correct pocket. Presenting to you, the Blue Captain Kirk Star Trek Beyond Jacket from the movie “Star Trek Beyond.” Chris Pine wore this as Captain Kirk in the film. PU leather is used to create the exterior of the Captain Kirk Star Trek Jacket. Inside the leather jacket, there is viscose, an erect collar with zip closure and two waist pockets.